CLOVIS, CALIFORNIA (April 9, 2019) – 16 year-old Austin Herzog of Clovis, Calif. steered the #11 to victory on Saturday night at Madera Speedway for his first career Madera Pro Late Model Series win at his family’s home race track. The third-generation racer added to a resume that includes six Jr. Late Model Series wins at the one-third mile venue. 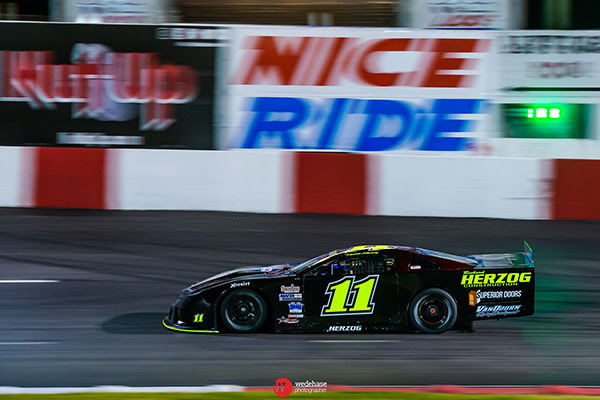 Herzog previously was the runner-up in the 2018 championship standings with three fast-times and five top-fives in the nine race series. Saturday’s event also marked nearly the 40th appearance for the young racer in a televised race dating back to 2016. He qualified third quickest and then started third out of the 21 starters after the redraw. A long 27 lap green flag run opened the 80 lap main event with Herzog closely following the leaders in a nose-to-tail formation. Herzog advanced into second by lap 31 and began his long assault on race leader Carlos Vieira from the inside. The duo raced side-by-side through a pair of additional restarts and continued to battle until the race went into its break. Coming out of the break on lap 46 for adjustments, Herzog, Vieira, and defending track champion Matt Erickson raced in three-wide formation on several occasions. Herzog continued to pounce from the inside and took over the top spot on lap 69. He built up a solid advantage on the pack that was nullified by a caution period. The ensuing restart saw contact nearly send Herzog spinning coming out of turn four, but he managed to back down the car without hitting the wall. A caution for an incident behind him nullified the contact and allowed him to keep the lead. The final restart sealed the deal when Herzog drove away to a 1.849 second lead in just five laps of competition to earn his first Madera Pro Late Model win. He ended the night with a smoky burnout to the appreciation of the crowd. Austin Herzog Motorsports is competing for the 2019 Pro Late Model championship on MAVTV from Madera Speedway. Their next event is April 27th. The team also intends to compete in select Super Late Model and SRL Southwest Tour races. Austin would like to thank his sponsors Sanger Concrete, Richard Herzog Construction, Wilson Motorsports, Stark Naked Designs, Superior Doors, and VanDoorn Racing for their support. For more information, check out Austin Herzog Motorsports at www.AustinHerzogMotorsports.com Austin Herzog Motorsports can also be found on Facebook, Instagram, and Twitter.